I am so excited to share the news that we have just adopted two beautiful cats from the Liverpool Welfare Rescue Centre. 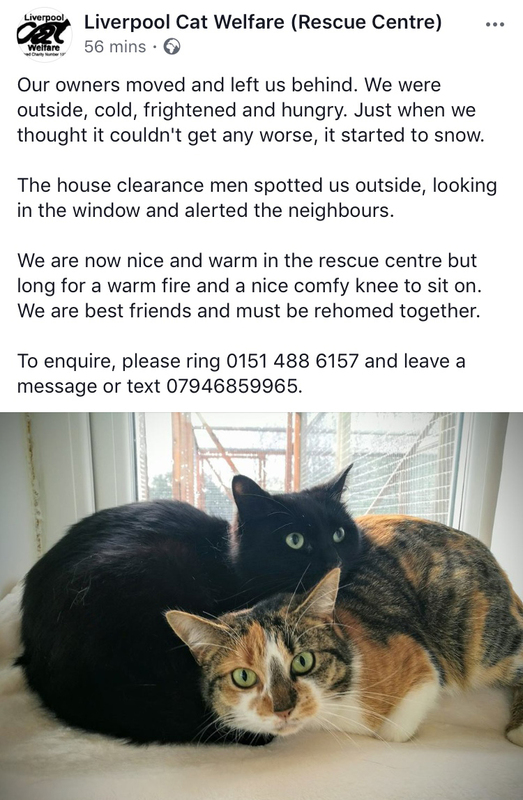 As soon as I moved to Liverpool a year and a half ago I started following them on Facebook...but only now that we have settled in our new house has it felt like the right time to rescue some kitties! I saw Alfie & Pixie on the Facebook page, an hour later we went to meet them and fell in love! My first ever cat was a tortoiseshell & I had my heart set on adopting a black cat (they take 13% longer to adopt than other cats) so these two cuties were my purrrfect pets. They were rescued from the centre as kittens 20 months ago, and sadly abandoned again a few weeks ago. So happy that we can give them their forever home now! They arrived yesterday and although Alfie is a bit shy at the moment they seem to be settling in well. The rescue centre do such great work so I just want to say thank you to June and her team.